I made this salad as the starter for my valentine’s meal for two, as we decided to stay in rather than go out for a meal. This salad would easily work as a side dish. 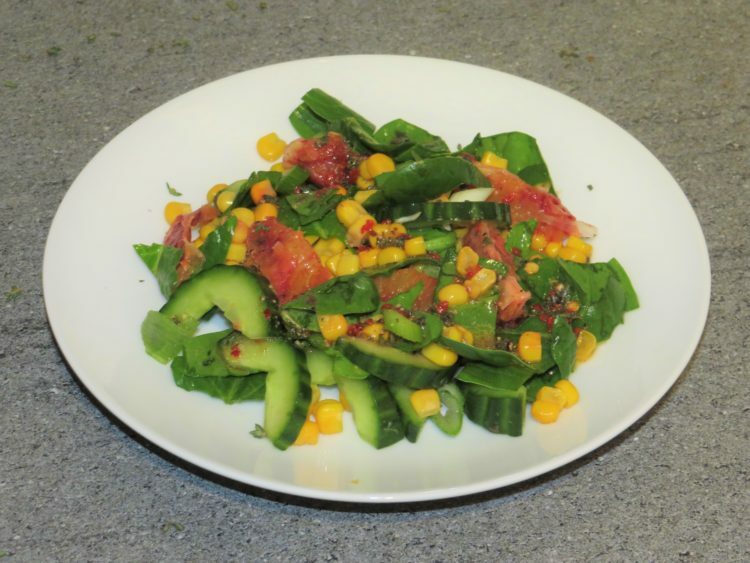 1 Place all the baby spinach, cucumber, blood orange, sweetcorn and spring onion in a salad bowl. 2 Put all the ingredients for the dressing in a jar and with the lid on give it a good shake or in a small jug and mix it all together. 3 Then pour the dressing in to the bowl all over the salad. Toss the salad in the dressing, then serve on to small plates and enjoy. Tip. 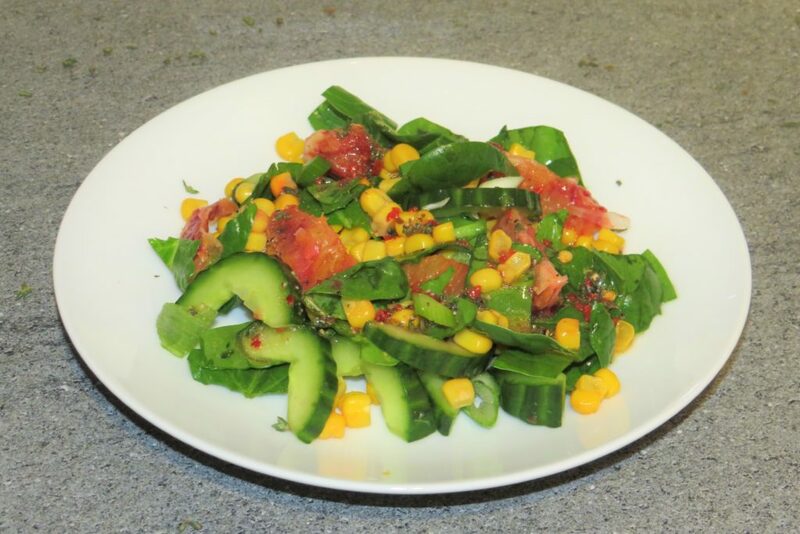 If making this salad ahead of time add the dressing when you are ready to serve. Always serve salad at room temperature. Blood orange has the benefits from an orange plus the anthocyanin anti-oxidant found in berries from the red colour pigment. They are high in vitamin-A, vitamin-C, potassium, dietary fibre, calcium, niacin and folate. Cucumber have mild diuretic properties, helps keep your weight in check and blood pressure. They are a good source of potassium, B-carotene, a-carotene, vitamin-C, vitamin- A and vitamin-K.
Sweetcorn is high in dietary fibre, B-complex vitamins, copper, manganese, iron, magnesium and zinc.